« Message to Senate Transportation Committee: Safety First! The Guemes Channel Trail will provide an outstanding riding experience along the waterfront from downtown Anacortes to the ferry terminal–a bike travel experience you won’t want to miss, a connection for bike commuters, and an enhancement for adjacent property owners and developers who are investing in the trail. 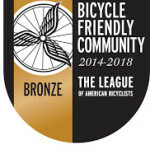 Thanks to the work of local advocates Anacortes has become the latest community recognized by the League of American Bicyclists as a Bicycle-Friendly Community, joining 10 other cities in the #1 Bicycle-Friendly State in the US to receive the honor at some level. The Go Skagit headline gives credit where it belongs: “Medal to the Pedalers.” The advocates who have worked for years, and who gained Honorable Mention status for Anacortes in a previous application round, used the standards of the League’s BFC program to work for improvements. 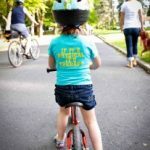 The great people pushing to make Anacortes a community that actively welcomes cycling of all kinds. Local achievements including the Tommy Thompson trail, Guemes Trannel Channel, New Bicycle component to the Transportation Comprehensive Plan reviewed and approved by the city council, and the Local and Regional Bike Corridor Map for Anacortes and Fidalgo Island showing difficulty ratings, steepness, etc. And of course, the great support from Anacortes Bike/Pedestrian Advisory Committee (AB/PAC), Skagit Active Community Task Force (ACT), and citizens. 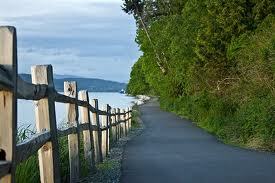 Anacortes Wants the Guemes Channel Trail! 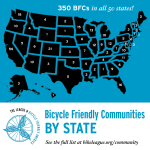 Does your community want to be recognized as bicycle-friendly? 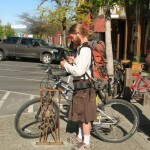 This article was posted in Advocacy, News, Skagit County, Trails, Transportation and tagged Anacortes, bicycle-friendly. Bookmark the permalink. Follow comments with the RSS feed for this post. Both comments and trackbacks are closed.